It has been recently reported that the Thai government is in the process of mandating mandatory medical health insurance for expatriates living in Thailand. The requirement is targeted for expatriates that are living in Thailand on a one-year non-immigrant visa, with an emphasis on those living in Thailand over the age of 60. Over the past years, it has become increasingly difficult for those living in Thailand over the age of 60 to procure health insurance. There are very few local insurance companies that will cover those in this older demographic, and those few companies that will cover those 60 years and older are demonstrating predominantly expensive premium rates. There are even some foreign plans that will place limits on your global health coverage after age 65 or terminate coverage at age 70. The best plan for older expats that our firm has found is the Cigna Global Health Options plan we offer online to expatriates of any age – expats even in their 80s and 90s can get a quote online. The proposed Thai legislation will require expatriates to be covered for the minimum amount of 400,000 ฿ (~ $12,570 USD) of in-patient coverage, and 40,000 ฿ (~ $1,270 USD) for out-patient care. Expatriates that are currently living overseas and meet the minimum required amount of coverage will be exempt from obtaining these Thai insurance policies. These mandates have been derived with several government bodies in Thailand’s government. The process for finalizing these policies are currently in the stages of cabinet approval and is designed to aid and ensure the health protection for long-stay visa holders currently, or soon to be living in Thailand. It is important that expats monitor developments on this policy and make sure that they have adequate health coverage that will meet or exceed the requirements. Thailand is a beautiful country and a very popular destination for expatriates from around the world. Medical care can be quite expensive and it is vital that you obtain a comprehensive global health policy for Thailand that will cover you both locally, regionally and globally. This is because you may move to another country or region and you don’t want to re-apply for medical coverage, especially if you develop a pre-existing or chronic condition. Nothing is bound to ruin a holiday more than feeling unsafe or running into scams and difficulties. When travelling to other countries, it’s important to always keep international travel safety in mind. Travel risk is unavoidable, but we have created a list of 12 tips that will increase your safety so that you can enjoy your holiday! An unexpected illness can truly ruin a holiday. Make sure to be fully up to date on all your vaccines and double check all the recommended vaccines for your travel destination. Most countries will have a categorized list of all the recommended vaccines for international travellers, and where you can go to get your vaccinations. In order to avoid high credit card and debit card fees, we recommend using cash whenever possible. It is also highly recommended that you separate your important cards in case of theft. Have backups if possible, as well as an emergency cash flow just in case. It is important to separate cash, cards and identification cards for any potential problems. Of course, it is also important not to carry too much cash with you and not flash cash when paying your bill in order to avoid becoming a victim of crime. In case of emergencies, you will want to have access to a phone that has the ability to call internationally. Whether you need to call your family back home or your insurance provider, you won’t want to be stuck trying to find a phone with international capabilities in times of emergencies. When travelling internationally, especially to culturally diverse regions, it is crucial that you do your research on cultural norms and how the local population behave on the day-to-day. It can be dangerous to be in a situation that is culturally acceptable in your home region, and unaccepted in the region you are visiting. Local natives can find offence to certain behaviours, and it is recommended that you behave in culturally appropriate behaviour for your protection. The last thing you need while travelling internationally is to have your cards cancelled or put on hold while away. In order to avoid any situation where this could happen is to notify your bank before leaving. Many banks don’t require notification now, but we recommend always placing a note with your bank for your accounts to avoid any potential of the card holds. Travelling in numbers is highly recommended when travelling internationally. A large group of people is much less of a target for potential danger than comparison to someone travelling alone. Another important note while travelling is to project situational awareness. If you are in a foreign land, it is very important to project, to the best of your ability, situational awareness. If you are in an environment with confidence, you are much less likely to attract potential scammers. Many regions while travelling internationally will have different food and water restrictions then you have in your home town. If you are travelling internationally, it is very important to research the food and water safety warnings that are in place for those destinations. This will allow you to avoid any potential foods and water derived illnesses in order for you to enjoy your trip! Although we recommend printing all your necessary travel documents for your travels, it is also highly recommended that you have access to electronic copies of all your important travel documents – including hotel + flight bookings, passport photos, and insurance policy numbers. This is a preventative precaution in case you lose any of your paper copy documents. In times of emergency, such as losing a passport, it will be very helpful to have your embassy and consulate contact information and address for where you are travelling. Most major cities will have a list of all the international embassies that are located within the city for your convenience. 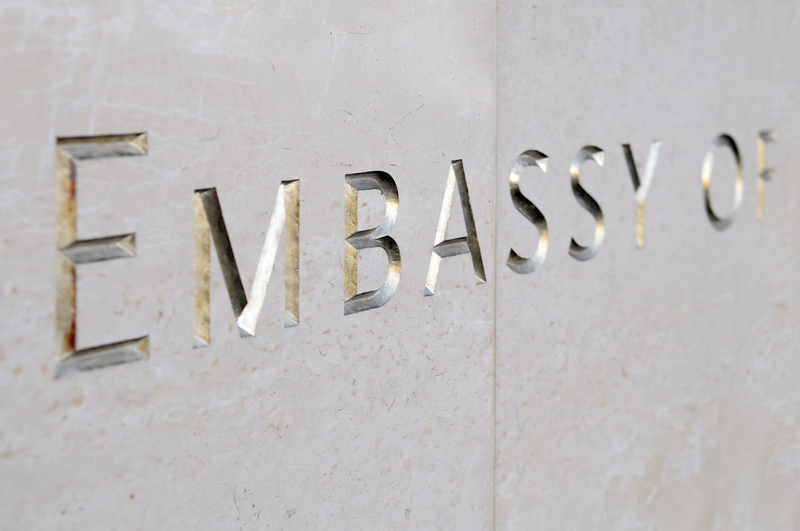 If your country doesn’t have a local embassy, it will be important to have the contact information for the nearest one, as well as contact information for your embassy back home. Whether you are travelling alone or with friends, it is recommended that you have your family and friends back home know your general location and plans while away. Although having your jewellery with you may seem appealing, we recommend leaving your expensive and valuable jewellery back home. Travellers displaying expensive jewellery are often targets for theft which can lead to very potentially dangerous situations. In order to stay on the safe side, it is better to simply leave it all at home. While travelling internationally, most domestic health insurers will not cover you when you leave your country of citizenship, so travel insurance is a necessity. The potential of getting sick or injured while travelling is inevitable, and if you get injured or sick and you can’t get adequate medical treatment in the country or city you are visiting, it will be important to have access to emergency medical evacuation to another country or back to your country of residence. For the simple purpose of peace of mind, purchasing travel insurance is highly recommended in order to protect yourself. Expat Financial offers citizens travel insurance from a variety of insurance companies. Get a travel insurance quote and even purchase online. Get travel medical insurance and trip protection plans online via a secure server. Click here to receive an online quote. The opportunity to live a life as a global citizen is one that is appealing to many people. It involves a life of adventure and new experiences. If deciding to become a global citizen, it is important to understand what it takes to successfully take on the opportunity in which you are given and facilitate the transition period. Let’s dive into what it means to be a global citizen. As many concerns arise about making the decision to become a global citizen, health considerations are likely to be at the top of your priorities before moving. Taking care of your health while living abroad will be one of the most important and crucial steps to ensure a successful and blissful lifestyle. Global health insurance is highly recommended for anyone living or travelling abroad. The advantages of global health insurance go far beyond basic medical care. It will alleviate any added stress or concerns about medical coverage while travelling abroad, as well as facilitated payments, coverage regions and standard of care. At Expat Financial, we offer plans from basic in-hospital plans to in-hospital and out-patient plans. We are able to provide various plans from several different insurance companies in order to find the right fit. Contact us today by email at info@tfgglobal.com or click here for a free online quote. Depending on where your global adventures take you, there is a high chance that you will be relocated to a country that will likely lead to a degree of culture shock. The important thing here is to stay as open-minded as possible. Locals will gladly teach you their culture and welcome you into their country, as long as you are willing to immerse yourself in the community. A useful type for overcoming culture shock is to learn the local language as well as possible. This will allow you to engage with more locals and feel less alienated when exploring and appreciated the new city in which you call home. When it comes to choosing where you want to relocate, there are many different considerations to remember. First, it will be important to understand the local culture and what it will mean to connect with the locals as an expatriate. A second aspect that is very important will be to find an area that has low crime rates for your safety – whether that is choosing, in general, a safe city or specifically a safe neighborhood. Explore our region & city guides to discover which regions are the best fit for you! A third factor that is important in choosing a location will be to know what the tax policies are for your incoming country. Many countries have different ways in which they tax their local employees, and as an expatriate living abroad, it will be very important to know the local taxation policies. Get involved in local politics and policies. As important as it is to immerse yourself in a local community, it will be equally as important to immerse yourself in the local politics and policies that are relevant to your new home. Knowledge of local politics will help you understand a multitude of important factors, such as taxation, governance, community values and elections, as these will all be crucial in your development in the community. It is important to note that it is not recommended to get involved in politics in all countries, and it is important to research beforehand and look into political stability before diving into local politics, especially if you are not a citizen of your new country. Getting involved in politics as an expat in many countries, especially ones with little or no human rights protections, can be very dangerous. Apart from local politics and policies, we also recommend having a general understanding of global politics, specifically with countries that directly affect your new city. This will allow you to stay aware of external factors and policies that may alter the way in which you engage with your community. Lastly, after making the decision to become a global citizen, it will still be important to stay connected with your roots back in your home country. This can come with many challenges, including adjusting to time zones, whether or not you are in a Wi-Fi efficient zone or keeping this priority top of mind. It is important to keep in touch with members back in your home country in order to maintain and facilitate the transition, as well as keeping in touch with your own mental health. There are numerous reasons as to why someone will make the decision to relocate to a new country and become an expatriate. The decision can be an inbound decision of wanting a new life of adventure or you are being relocated due to your job. Regardless of the reason, there are an abundant amount of benefits for making the move. The term expatriate is often misinterpreted and we are here to help you understand what it means to be an expatriate and how we recommend preparing for your new life. An expatriate is considered as anyone who is living outside of their native country – meaning the country in which they were born and/or brought up in. Expats that are living overseas can be considered in a permanent, semi-permanent or temporary placement, depending on the expats’ specific situation. When relocating abroad, regardless of the reason for moving, there are plenty of considerations to think about beforehand. Some top priority factors are to determine where your income will derive from, are you living in a safe area, how to attain housing, are you moving somewhere with a different language than your native tongue, whether or not you need a visa, and how does the medical care system work in your new country. We have created a small guide to answer some big-picture questions that are crucial to know before your big relocation. Most countries will require a visa in order to become a local resident, and the process and availability will be dependent on your country of origin, as well as the inbound country. It is very important to understand all the factors and limitations of your visa before moving. More often then not, a work visa will have a longer period of validity in comparison to a visitors visa, resulting in a more stable duration of stay. Your international relocation may bring you to a country that is vastly different than your home town, whether that be in Africa, Asia, Europe or South America. Each region and country around the world has it’s own unique offerings to you as an expatriate, and it will be important to learn and appreciate how differently things are done. One aspect that will greatly benefit you as an expatriate will be to learn the local language as well as possible. Learning a new language has many benefits and challenges, and in the end, it will greatly improve your experiences in the new country. The more you adjust and dive into the culture and experiences of your new home, the easier it will be for you to adjust and enjoy your time away from home. Countries all around the world vary in healthcare, in cost and standardization and care. As an expatriate living abroad, you will want to have the best healthcare coverage as possible. In most circumstances, countries will require expatriates to obtain a global medical coverage plan for extra protection, as most expats won’t be covered under a domestic plan. A comprehensive global medical plan that can move with you and cover you locally, regionally and globally – especially back home will be critical. A major benefit of a global medical health care plan is the ability to cover other dependents as well – whether that be a spouse or children. Obtaining the best care for yourself and your family will be extremely important as you choose to live an expatriate life. Domestic government health plans often only provide access to public hospitals and doctors. This may become problematic as you will have more restrictive access to medical care. In order to avoid the complications of long wait lines, extra costs of medical testing and surgeries, most expats will seek out a global medical care coverage in order to have access to private hospitals, doctors and clinics. As rewarding as living an expatriate life can be, there will surely be some obstacles along the way. Here are some suggestions in order to get the most out of your expatriate experience. Appreciate the cultures and languages of your new country! Many people will never be given the opportunity to travel and live the way you are, so make sure to take the time to dive into new cultures, meet the local populations and learn to appreciate the way of life that is different than your norm. Moving abroad is the perfect opportunity to do a major clean out of your house! Deciding what to pack when moving abroad can be a stressful and tedious experience, however, it is an excellent opportunity to purge out old household items and clothing that you don’t need! As you are becoming an expatriate, it will be important to engage in an expatriate community as well as the local natives. There are several benefits to relying on other expats, including learning from their past mistakes and suggestions, as well as their knowledge on conducting business and creating a social life in a foreign land. It will also be important to know about your countries taxation policies. As all countries differ in tax legislation, it will be important to be up to date on your tax status and whether double taxation agreements are in place between the two countries. Lastly, obtaining your international health insurance before relocating, or within the first few days of moving will be crucial. This will alleviate a large amount of unnecessary and added stress that is preventable in order to protect yourself. At Expat Financial, we are able to meet the growing needs of expatriates living around the world who require global healthcare coverage for themselves and their families. To view available international health insurance plans available, click here! Make a Financial Checklist if You Are Moving Abroad! Financial planning is often considered confusing, frustrating and time-consuming, especially for expatriates who are busy enough living and working abroad. However, don’t let it frighten you off. Financial planning aims to help take control of your life and budget, and achieve your financial goals. This is very important for expats living and working overseas. In order to have a clear picture of what you want, it is recommended that you create a simple financial checklist before moving abroad. Do you want to own a home or rent an apartment? Expatriates working overseas will have the chance to own a larger amount of disposable income. A clear financial goal is important if you want to make the most of your money. For expatriates aiming to purchase home overseas, it is suggested to look for neighbourhoods with appropriate community services and excellent schools. This will be attractive for future resale value. If you decided to rent an apartment, make sure to check the entire room before signing the lease contract. Rental agreements will vary, you are responsible to read carefully before signing. Any unexpected events or risks could hurt your financial health. Financial professionals suggest holding at least 3-6 months of income as emergency savings. This is especially important for expatriates living overseas in the event of any financial emergencies. It is recommended to establish a monthly budget to cover day-to-day expenses, protecting cash account being invested or overspending. If you have a retirement plan at hand, you will be clear when making major decisions such as what lifestyle you can afford, how much to save and where you will retire. The earlier you get the retirement plan ready, the more comfortable retirement. A lot of factors will help to design your retirement plan: investment returns, cash flow, country-specific benefits, etc. You should talk to an expat investment expert who may be able to guide you in the right investment plans and investments. Generally, the closer you are to retirement the less risk you may want to take. Expats may want to think about if your investment accounts are consolidated and organized? There are also many retirement hot spots for expat retirees such as Costa Rica, Mexico, Thailand, etc. There are many reasons why expats choose to retire overseas: lower cost of living compared to western countries, beautiful beaches, cuisine, climate, etc. Check out our Expat Retiree page to read more about international health coverage needs for your current or upcoming retirement plan. Have you undertaken adequate tax planning and preparations before moving abroad? Tax issues can be complicated, especially for international citizens. Moving abroad can involve significant tax implications – some positive and some negative. For example, some Canadians become non-residents for tax purposes when they move abroad along with significant tax savings depending on the country they will be residing in. For American expats, it can be quite complex as well. It is recommended to visit your local tax office and consult expat tax experts before moving overseas. We often recommend that expatriates talk to an expat tax expert such as Citizen Abroad Tax Advisors. We also list several other firms on our links page. Have you made financial arrangements in your new home country? If possible, it is wise to arrange for a new bank account in your new country of residence and bring adequate ID and financial letters from your home bank. You may also need to transfer money into a new currency – we recommend our foreign exchange associates at OFX and use them ourselves. You should also check into money restrictions and regulations in your existing and new country of residence. Do you have international health insurance to protect you and your family while living abroad? Yes, as you can guess global healthcare is near and dear to our heats! We work with many expats who reside where the local healthcare system is usually not the best choice. That local health coverage may not even be available, especially if you are residing in the developing world. You may not even be eligible for local healthcare or it simply may be substandard. The cost of using private medical care is usually very high in many parts of the world, especially in parts of Asia and of course the USA. It is common that you may be living in a country where medical care is inadequate, and you may need to see medical care regionally or globally. The expense of emergency medical evacuation is also quite expensive. For example, we know of a friend of ours who was charged 75,000 USD for a short evacuation flight from one island to another. A large medical bill can destroy your financial goals and hurt your financial future. If your employer is providing health coverage, make sure it is adequate coverage for both you and your family. Note that some companies do not extend coverage to dependent spouses and children. With an appropriate international medical plan in place, many individual expats and their families are covered around the globe (except in the USA unless you add it as an optional benefit). International health insurance plan provides day-patient care and full hospital coverage, preventive medical care, extensive cancer coverage, maternity and baby care (conditions may apply), dental & vision care and international medical evacuation and repatriation. This is especially important for expats going to visit the more rural areas in some less developed countries. Expat Financial can source global medical insurance plans for expatriate families that can provide excellent coverage and premiums. We have been offering international health insurance coverage on an individual basis for many years. For more information, please check out our International Health Insurance page. Moving to a brand-new country is never easy. Learning a new language can take years. And moving to a brand-new country while attempting to learn a new language can be downright daunting. Understand that learning a new language is difficult! There are multiple ways of learning a new language and not every way will work for you. No one is expecting you to learn a brand-new language perfectly and to be fluent speaker right away, especially if you are learning a language with many complexities like Russian, Mandarin, Arabic, Korean, or Hungarian. The faster you can come to terms with this notion, the faster you can get over any anxiety and embarrassment that may come with learning a new foreign language. Relax, figure out what method works for you, practice, and enjoy the process. Immerse yourself in the language. Pay attention to the street signs, the advertisements on the sides busses and on billboards, read food labels when grocery shopping; all of this helps (especially when learning a new language alphabet). Celebrate your wins when you recognize what the words or phrases mean. Try ordering your daily cup of coffee at your neighborhood cafe in the local language. Find out the keywords or phrases to get by and say pleasantries like please, thank you, may I, sorry, etc. and use them on a daily basis. They will become automatic and make you more confident. Self-study. If you like to learn on your own there are many books out there on learning new languages. You can check out local books stores in your new country, many of which will have books on learning English or baby books. Don’t discredit these books, reversing how you view the language may be quite helpful. And there are thousands of YouTube videos, podcasts, and apps to help you self-learn – most of them free. Listen or watch videos on your daily commute or for a few hours a day when possible. Making use of technology can be a lighter and easier way of learning as many apps aim to make the learning process fun and game-like. Talk to the locals who speak English, they can help correct you and guide you. If you don’t know a local who can help, join a learning group. Join a learning group. This will allow you to be in a structured environment to learn the new language. You will get feedback, be sounded by others from various different countries who are trying to learn the local language and may even receive assignments to test your knowledge. Find fellow expats, but beware of slipping back into your native tongue. Get creative. Make flashcards, try to write up your work emails or everyday texts in English and the local language, visualize the new language rather than relying on a direct translation. Have fun with friends or family members who are trying to learn the new language, get into a habit of picking a category to talk about ex. “colours” or “foods” and say the examples in the language. Watch the news for articulation and pronunciation. If you are in a big city check out a play, visit museums, and see movies in the language you are trying to learn. And finally, something thing you might want to consider before choosing a language learning method is what purpose are you looking to achieve by learning a foreign language? Do you need it mostly for writing? Talking? Business? Can you get by without learning too much of the local language? Learning a new language will always assist in ensuring a good quality of life and freedom within your new country. A new language will assist you should you require medical care from a facility or doctor who doesn’t speak your language. A great medical plan will also provide medical insurance support in all of the major languages. Expat Financial offers several different international health insurance plans for expatriates of any nationality across the world who are about to move abroad or already there. If you have any questions regarding international medical insurance plans or you want to discuss your needs as an expat, please contact us or complete the quote form. So, you’ve decided to go abroad! You’ve decided to take the leap and perhaps teach abroad for a couple of years, or to travel for a few months, or to retire internationally… Whatever the reason is, your big decision to travel abroad needs to be accompanied by a list of essential to-do items that you should follow through with before leaving. The key thing for you to remember before going abroad is to prepare yourself as much as possible. There’s nothing better to bring with you on your travels abroad than peace of mind. Following these three essential (but easy!) steps before you embark will put you more at ease. Research, research, research. This will make it easier for you to prepare what to pack, what documents you need to complete before going abroad (visas and other documentation can take a few weeks to a few months to process, so you need to account for waiting time), what costs to expect, and what kind of insurance you’ll need while abroad. Making sure your visa and passports are up to date and registering for your trip with the government, including entering your itinerary, is something that will come up while you do research on your destination. For example, if your destination is a remote country, you’ll be advised to register your trip online so that in the case of an emergency, the government will be able to locate and contact you. A little effort goes a long way. Research how much to tip in restaurants, what conservative attire you’d need when traveling to conservative countries, and how much entrance and exit fees in certain countries may cost you. On the note of unexpected emergencies, it’s necessary for you to obtain international health insurance. It’s very likely that your domestic health insurance won’t cover you while you’re abroad. Though many are aware of this, people often fail to adequately prepare for not having their domestic health insurance at their disposal while they’re travelling internationally. You absolutely need international health insurance while abroad. Not having international health insurance means failing to protect yourself from potentially pre-paying for medical procedures that can be costly abroad and shouldering a heavy financial burden. It can be confusing to obtain coverage that adequately meets your requirements and those of your family, but Expat Financial is available to answer any questions you may have and walk you through the process of obtaining adequate international medical coverage. Contact us today to assist you in purchasing a plan that works best for you and your family or to obtain a quote. Call your bank or credit card provider to let them know you’re travelling. Many people leave this one essential step forgotten amidst all the other to-do items they have on their list before going abroad. If you don’t inform your bank or credit card provider that you’re going to, say, Paris, when you’re supposedly in New York City, they will turn off your credit card as a security measure. On that note, always have local cash on you – just in case. While the logistics and planning of going abroad can be overwhelming and complicating, following these three basic steps before everything else will lessen the burden of having to plan to pack up everything and move across the world. Remember, your international health insurance coverage is essential and should not be forgotten before you embark on your travels. Contact us today to obtain a quote or answer any questions you may have about the policies we provide through our many international health insurance providers, such as IMG, Cigna and GeoBlue. Ensure your visa and passport are up to date. It’s always important to ensure your travel documents are updated. Ideally, your passport will be valid for at least six months before flying abroad, just to be safe. These four essential steps will help you prepare adequately for your travels abroad and minimize potential risks, so you can have peace of mind before you embark. Moving overseas can be challenging for expat couples. However, if you are planning to have a baby and start a family abroad, you are adding a huge financial and emotional commitment to the complications. And in most countries, the expenses of labour and delivery for expats can be incredibly high. In this article, we will discuss the importance of maternity insurance coverage to minimize this financial risk with our top 5 tips for pregnant expats. According to research from The Telegraph, a cesarean section would cost around $14,000 in many hospitals around the world. Normal childbirth in North America would cost $15,000, and in Singapore, the cost will be well over $10,000. If you include hospital stay, medicine, and anesthetic, the bill will most likely be a lot higher. What many expatriate couples may not know is that individual expat health insurance plans will almost never cover existing pregnancy. Besides the high expenses of delivery, routine tests and prenatal care can also be very expensive. Due to the high cost of maternity overseas, it is critical that you obtain maternity coverage if you plan to become pregnant. Most individual plans have a 10 – 12 month waiting period for pregnancy and generally only the upper tier plans will offer any maternity coverage. Maternity can often be included in a plan or purchased as an optional benefit. Our most popular global health insurance plan is offered by Cigna and both their Gold and Platinum plans have maternity coverage with the standard waiting period on their contract. Most group expat health plans that are set up by your employer will cover a pregnancy without a waiting period. Most expats would want to use private hospitals while getting pregnant overseas. These private hospitals can offer the best medical care possible, with English speaking doctors that cater to foreigners. Many international health insurance providers offer a list of medical doctors and hospitals that are in the insurer’s network. There are also many routine checkups during pregnancy to reduce your risks for potential diseases. It is advisable to research the birth facilities and the doctor’s experience and qualifications before settling in on a hospital and doctor. You will want to make sure that the hospital is both recommended and able to deliver your baby safely. Regular check-ups with the doctor in your new home country will also be vital. It is important for pregnant expats to eat healthily and on time. A balanced diet and moderate exercise will help you keep your body healthy. Try to cook healthy instead of eating out. Avoid alcohol, caffeine, and smoking. Make sure that your pregnancy diet is nutritious. Always include protein, vitamin C, calcium, fruits, and vegetables. Ask your doctor about prenatal vitamins that you should take before and during your pregnancy. Many medicines are not recommended during pregnancy. Always talk to your doctor about medical treatment for any illnesses during pregnancy. It all involves common sense measures that your primary care doctor can discuss with you. 4. Make Sure Your Baby will be Insured at Birth? Some international health insurance policies can provide coverage for newborn babies from birth, while others cannot. It may depend on whether you satisfied the 9 or 12 months waiting period for pregnancy coverage. It is essential to check with your insurance provider or employer for the new baby enrolment. In case of emergency, your hospital in your new country may not be familiar with your medical history or latest prescriptions. Therefore, it is recommended to carry all medical records with a list of allergies in the local language to facilitate emergency diagnosis and treatment. As international health insurance expert, Expat Financial is often contacted by expats who are already pregnant and require international health insurance; however, our experience is that there are neither individual expat health plans nor travel medical plans that will cover an existing pregnancy. Only a large group expat benefit plan will potentially cover an existing pregnancy. Also, your home country may provide public government-funded coverage that will cover the existing pregnancy. It is very important to include maternity coverage in individual expat health insurance plans. Contact Expat Financial for more information on which international health insurance plan will meet your family’s requirements and budget. We hope that your expat pregnency will be a health, happy and safe experience in your new home country and look forward to discussing your requirements. We can also discuss expat life insurance. Located on the east coast of Central America, the Caribbean has 17 dependent territories. Though small in total size, the Caribbean has a favourable tropical climate, a mixture of culture with different influences such as French, Spanish, and English, as well as beautiful beaches that make this region a natural choice for expatriates to live, work and retire. The natural beauty of the Caribbean attracts millions of travellers and expats visiting the Caribbean each year. In this article, we will discuss 10 great reasons to move to the Caribbean and become an expat. This includes people to move to the Caribbean for work, long-term travel or retirement. The climate of the Caribbean is tropical to subtropical, with year-round sunshine and moist wind. The rainy season starts from May to October, while hurricanes occur between June and November. The average temperate is around 28 to 30 Celsius. The hurricane season is from July to October can bring powerful storms to your island, so it is critical that you obtain a property with adequate storm protection. You may want to exit the Caribbean in the Summer months when the humidity and heat can be quite extreme. Many expats will choose to return to their home country to see family members during this time. The Caribbean is well known for its beautiful island life and excellent beaches. You can experience impressive beaches such as Shoal Bay in Anguilla, Palominos Island in Puerto Rico, as well as Eagle Beach, and Nassau. They all have warm waters and white sands. It really is a natural paradise for beach lovers. The Caribbean islands are full of marine life including turtles, rainbow coloured fish, coral, reefs, and dolphins. Diving is definitely a great activity for tourists and expats. For experienced surfers, long coasts and tides in the Caribbean will provide an unforgettable adventure. There are also many surfing training classes on the islands for new surfers. The Caribbean cuisine has many influences from Africa, Europee Latin American and Spain. Local restaurants prefer to use a kind of green herb and olive oil as common ingredients, as well as coconut, potatoes, bean, and tomatoes. Meats and seafood are widely consumed on the islands. In Jamaica, one of the most popular dish is Saltfish, served with ackee fruit, which is the national fruit of Jamaica. Ackee and Saltfish is the national dish of Jamaica, but a favourite for locals and expats alike is Jerk Chicken. Many expats and locals will enjoy an island staple called Conch, a tropical mollusk that is quite common on the islands. Residents living on the islands come from different countries and cultures all over the world. As a multicultural community, you will hear different languages such as English, Dutch, Chinese, and Spanish. As a result, it is all the more likely that you will encounter your native language spoken on the islands. The people in general are very friendly and welcoming. Unlike many countries in the world, most of the islands in the Caribbean have desirable tax rates for both companies and individuals living there. Known as one of the most chosen tax heavens by many expats in the world, the Caribbean islands provide financial privacy and little or no tax policy. One of the most used nations in the Caribbean is the Cayman Islands. Offshore corporations do not need to submit financial reports to any Cayman government. Besides, for international business companies, the Cayman Islands have no income tax nor corporate tax. The other popular option is Panama. The level of security and privacy of account holders in offshore banking services attracts many expats from all over the world. There are many all-inclusive resorts on the islands, as well as a variety of accommodation types no matter you are looking for luxury hotels or a budget place. To rent an apartment in the Caribbean, for example in Anguilla, a two bedroom and two bathroom apartment located in Crocus Bay Beach costs USD $750 per month, according to Sublet.com. Properties on Ambergris Caye, Belize, can be found around USD $17,500. It is important to talk to an experienced real estate agent on the islands that you are thinking of living in as he or she should be able to find a home or condo that can meet your budget should you wish to buy or rent. There are more than 7,000 islands in the Caribbean and they belong to at least 28 nations. Many people recommend destinations such as Bahamas, BVI, Anguilla and Barbados. Many will move to the Cayman Islands or Turks & Caicos, which are considered great islands to live and retire. These islands are also quite safe and well run. The Caribbean offers a range of family-friendly activities to expats and tourists from beach activities and boat fun tours. These kinds of arrangements will keep your children busy so that they won’t get bored while you are out enjoying yourselves. Generally speaking, the cost of living on the islands is reasonable and affordable. The accommodation on most of the Caribbean nations are relatively inexpensive when compared to western countries. Local produce is also low-cost. Expats planning to retire in the Caribbean would want to consider Panama – as they use US dollars and is very affordable on pension income for retirees. Expat Financial has a great deal of experience in sourcing international insurance plans for individual expatriates and even expat employers in the Caribbean. We can also source global medical coverage for select local nationals in the Caribbean that will allow for global medical coverage that includes the United States. Most expats in the Caribbean will want to consider an international health plan that will cover them for treatment in the USA as local hospitals may not have the level of medical care that is necessary for many illnesses. Also, most local plans will only cover you on the island or provide very limited off-island care. The expat healthcare plans are available via our firm from a variety of international insurance companies. There are a hundred reasons to live, retire and work in the Caribbean. If you require a quote for the Caribbean expat insurance, contact Expat Financial today for a quote.